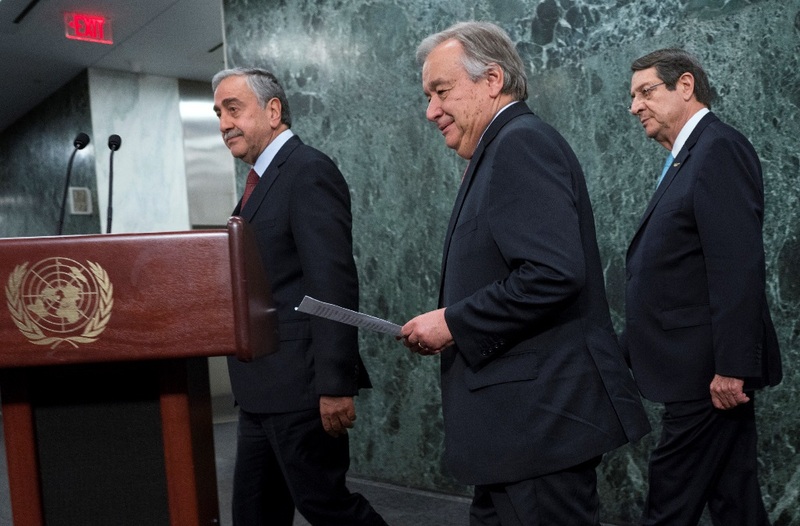 The UN Secretary General, Antonio Guterres, does not appear particularly optimistic about the progress that can be made in the Cypus problem, an observation he mentions in his draft report that was published yesterday, with the complete report expected early this week. However, the report, to the satisfaction of the Greek Cypriot side, leaves a window open for the continuation of the effort by Jane Lute to agree on the terms of reference, as opposed to what officials of the occupied areas and Turkey were saying on the issue. In this respect, the UN Secretary-General also refers to the satisfaction derived from the Confidence Building Measures the two sides have put on the table, such as the interconnection of mobile telephony, although it states that there was a delay, and that everybody should focus on the framework of 30 June 2017. Despite partial progress in Confidence Building Measures, there are low expectations of real progress or agreement on terms of reference, UN Secretary-General Antonio Guterres says in the report. “Although recent efforts to establish terms of reference have yet to bear fruit”, he continues, “I still hope that the parties will use this opportunity to overcome the remaining disparities. We previously saw a flash of hope, including the Joint Declaration of 11 February 2014, and the willingness of the parties to come to Crans-Montana in 2017. But we also saw our hopes being destroyed. All Cypriots deserve our commitment to make every possible effort by supporting the parties to actualize the vision of an island united in peace and security”. Mr. Guterres reiterates his view that a settlement will require each side to accept less than the fullest measure of satisfaction on every issue, and referring to Mr. Lute he writes that while the parties have expressed their respective commitments to previous convergences and desire to maintain the advances reached in Crans-Montaña almost two years ago, efforts to formulate these commitments and wishes in terms of reference that would serve as the basis for the resumption of the definitive negotiations have not yet been achieved. The Secretary General is grateful for the receptivity and sincerity with which all the interlocutors have been involved in their contacts with Jane Hall Lute, and that the parties recognize that the status quo is not viable. “In all these meetings, the parties expressed their clear agreement that the period of endless negotiations is behind us and that the status quo is not viable. They also reiterated their commitment to finding a way towards a viable solution under the auspices of the United Nations and expressed the view that I would continue to be engaged, through Mrs Lute’s efforts, in finding a way to resume negotiations that would lead to an agreement within a foreseeable horizon”. What matters in every respect is what the UN Secretary-General says about the sense of urgency in the Cyprus issue. This is not the first time he refers to the subject with a similar tone but it is perhaps the first time that it is recorded with the sense of urgency. “I call on the two leaders, their communities, the guarantors and other stakeholders to engage in these efforts constructively, creatively and with the necessary sense of urgency”, he writes, reminding that Security Council has been consistently supporting for decades a bizonal, bicommunal federation that reflects the political equality of the two communities in Cyprus. “To help the parties promote this vision, on June 30, 2017, I proposed a six-point framework that would help to clarify differences in key issues. I call on the parties to look constructively at these points”, he stresses. Mr Guterres points out that the broad support for a horizon of endless process without result is behind us, not in front of us, something he has mentioned in the past. “There is consensus that the unchanged situation – the lack of a solution to the Cyprus problem – is not viable. Therefore, I will ask Mrs Lut to continue the discussions on my behalf. The way forward must be well prepared, with a sense of urgency and focus. I call on the leaders and the guarantors to continue their constructive engagement with Mrs Lute and among them, if necessary, and to create the basis for the resumption of negotiations. This commitment should be enriched with the sense of purpose and determination to reach a successful end within a foreseeable horizon”. The Secretary-General spends much of his report on the confidence measures agreed between the two leaders. In his remarks, he notes that the agreement of Anastasiades and Akinji to move forward with some confidence-building measures, many of which were agreed at the beginning of the last round of negotiations in May 2015, is a welcome development. “The almost four-year delay in implementing their previous commitment to such measures was a source of friction. These steps come at an important moment as efforts are under way to agree on terms of reference and represent some positive move in the peace process since the conclusion of the Cyprus Conference on 7 July 2017”, he said. However, he stresses that there has been a delay in the interconnection of mobile telephony and that “existing confidence-building measures, such as the opening of the two new crossings in November 2018, as well as the interconnection of electricity networks, contribute to building a momentum for peace and reconciliation on the island. However, only significant signs of returning to the negotiating table – including through an agreement on terms of reference – will provide convincing assurances to the two communities, other stakeholders and the international community in general about the real prospects for the peace process”.